Upon reaching Kathmandu, after several days of long bumpy bus rides from Tibet, the bustling streets of Nepal’s capital city were definitely a shock to the senses. The streets of Thamel (the tourist district in which we’d been deposited at the end of our tour) were full of life with brightly coloured shops spilling onto the roads, selling everything a tourist in Nepal could possibly desire from fake North Face jackets, to Buddhist and Hindu statues, and beautiful skirts, dresses, bags and beaded jewellery. Overwhelmed by the hustle and bustle of Kathmandu we rapidly departed for our 7 days trekking in the Langtang National Park. Having recharged our batteries we returned to Kathmandu for a fresh assault to find no longer a city to be endured but rather one to be enjoyed. During our second visit we toured Durbar square, visited the monkey temple (Swayambhu) and paid homage to the royal family by visiting both the old and new palaces. Durbar square, the centre of old Kathmandu, is actually a collection of squares housing several temples and shrines to Hindu gods and goddesses (some of whom double up as Buddhist deities), including one temple that is supposed to have been built from a single tree. On one side of Durbar square is Kumari Che, the home of the living goddess (mentioned in an earlier post), a beautiful courtyarded building with intricate woodcarved screens masking the glassless windows. 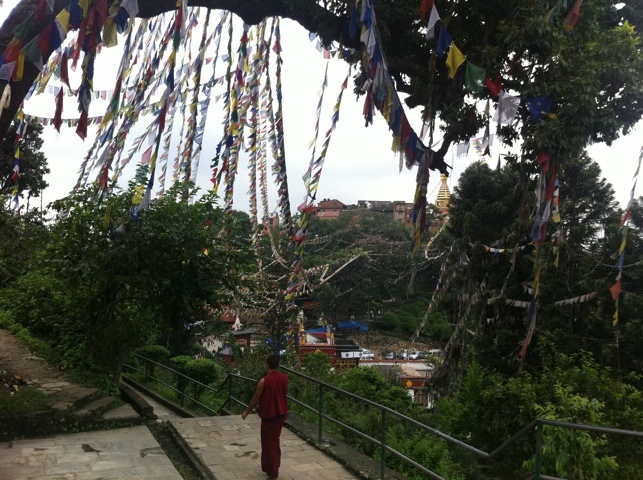 Swayambhu is commonly known as the Monkey Temple due to the large number of monkeys that have made this hill top temple their home. 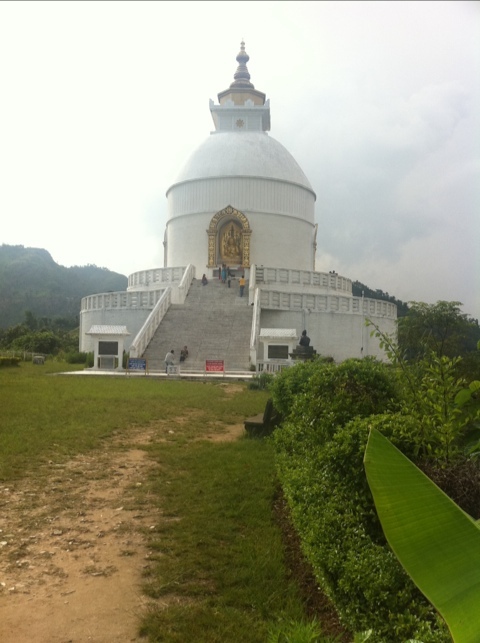 As you climb the steps to the golden stupa (and the all-seeing eyes of the Buddha), pairs of monkeys sit inspecting each other, swinging from tree to tree, clambering up railings, snacking on tourists’ litter, or simply watching the world go by. From the top of the steps, having undertaken a clockwise pilgrimage around the stupa you can truly appreciate the vastness of the Kathmandu valley. Our Australian friends had told us that the royal palace was worth a visit, if only for a morbid understanding of a place where 11 members of the royal family (including the then king Birendra) were shot by the crown prince in 2001. Having concluded our tour of the palace buildings we were a bit bemused as to why we couldn’t find the gardens or other places that our friends had described. It slowly dawned on us that there were two palaces! The following day we made our way to the new palace in the north of the city. To fill you in on the history, after killing his family in a drunken rampage in 2001, the prince turned the gun on himself and died several days later, causing an outburst of mourning across Nepal, for whom the former King and Queen were held in very high regard. The crown passed to the King’s brother but in 2008 the monarchy was dissolved by the government. The new palace, built in the 1960s, had the distinct feel of hotel in its prime in the 1970s, with little of the opulence normally associated with a royal abode. As we stepped outside the palace doors the grey skies began to empty, setting the mood for visiting the place where the royal family had spent their final moments. Although the building from which family members fled as the prince brandished his machine gun has been razed, bullet holes can be seen in a nearby screen door and plaques mark the places where others died. A very sombre place to end our visit to the palace and the capital. 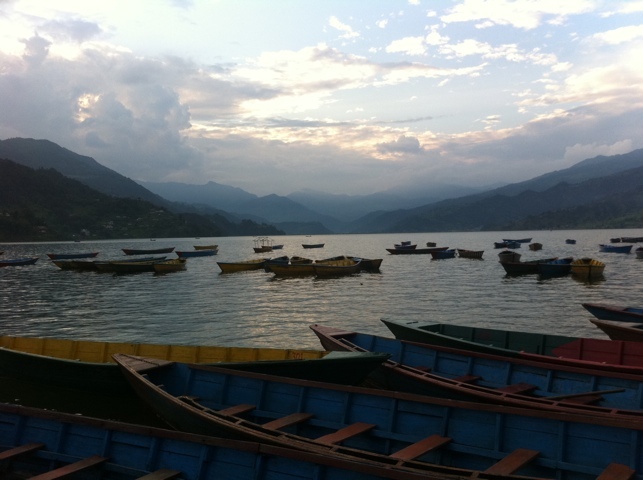 Feeling we’d spent enough time in Kathmandu, and after our bungee jumping at Last Resort, we decided to end our time in Nepal with a visit to the picturesque lakeside town of Pokhara. We spent two and a half days relaxing at lovely little lakeside cafes and restaurants, soaking up the tranquil atmosphere. One afternoon we took four exhausting but enjoyable hours to pedalo around the lake, drinking in the lush green mountain surrounds. On our final afternoon we walked around the lake and up to the Peace Pagoda affording us beautiful views of the lake and town below. In the late afternoon, crossing back over the serene lake, the clouds parted to give our first glimpses of the snowcapped Annapurna mountain range, the perfect ending to our stay in Pokhara. 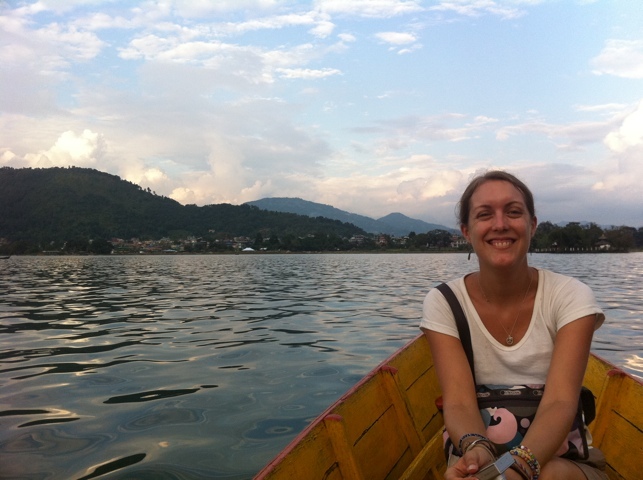 This entry was posted in Nepal by Laura. Bookmark the permalink.